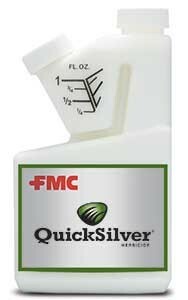 Get speed and enhanced weed control spectrum with QuickSilver herbicide in your postemergence herbicide tank. QuickSilver is gentle on turf, so it won’t harm desirable grasses, and it is engineered to be effective in both cool and warm climates. Extensive field trials have shown that tank mixes containing QuickSilver along with broadleaf herbicides speed up weed activity, reduce amount of herbicide required and improve overall weed control. You’ll see visible results in just 24 hours! What’s more, adding QuickSilver to your tank of Tenacity will reduce the bleaching (whitening) symptoms observed on susceptible weeds. Fast results mean satisfied customers. Keep them happy by adding QuickSilver to the tank.